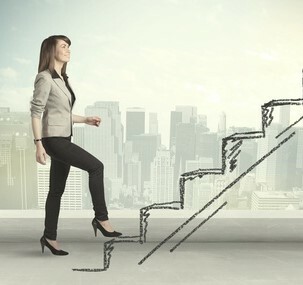 Despite the progress women have achieved in general and in law firms, many women continue to express frustration about how to compete and be successful as they climb the career ladder. Enlightened firms have tried to tackle unconscious bias through mandatory training and intentionally putting more women in management positions. Some clients have gone so far as to fire law firms that don’t meet their requirements for giving primary responsibility or measurable involvement on matters, and the resulting credit, to women and diverse attorneys. Younger generations of women below the Baby Boomers have reaped the benefits of women that broke down barriers before them and the advantages brought about by the progression of cultural norms and values that have continued to increase opportunities for women. But the barriers still exist. Some are externally driven by the still predominantly male power structures and bias in business and law firms. There are current examples of bias, for example (and these are true stories in the last three years) — a judge who addressed a question to a male associate in a court hearing, assuming he was the lead on the case, despite him being 10 years junior to the female partner sitting next to him in the courtroom. Or the private equity guys who, five minutes before a conference call, didn’t realize the female partner was on the line and shared with each other that while they liked her, they couldn’t really connect with her because she didn’t like sports and they didn’t have anything to talk about. Or the senior partner who handed off three key client relationships and all the origination credit to a new male partner when he retired, even though a female partner had been effectively serving these clients for five years previously. Some challenges are exacerbated by the search for life balance (which most men strive for now too) but also some general differences in the way men and women interact, see the world and see each other. There is only so much each person can do to effectuate change on the institutional or broader level, however, there are things women can do to improve their chances of success and reduce the frustration that results when the inevitable barriers and challenges arise. Men and women do things differently but when women recognize these differences they can use this knowledge to their advantage. Effective networking generates referrals to more “ideal” clients, provides competitive intelligence, opens up leadership opportunities, helps with personal and professional growth and helps you grow your practice. Your body posture and expression affect your mind — how others see you and how you see yourself. Amy Cuddy, a Social Psychologist and Harvard Business School Professor, has done an enormous amount of research and written and spoken prolifically about acting and being powerful and the physiological benefits that using “go big” power poses. Eye contact is critical to communication, as failing to make it tells others you are not listening, not interested, untrustworthy or not confident. The way you walk, talk, hold yourself and feel about yourself all come across to others and affect their impression of your trustworthiness and credibility. If you are in a physical office where a meeting is taking place, always attend in person. Don’t dial in by phone — it conveys you don’t have time or interest and you lose key opportunities to network. Prepare for meetings in advance – know the agenda, do some research, come prepared with cogent comments that you make at key points during the meeting. Get to the meeting early to seat yourself next to someone you want to connect with (or impress!) and stay late to connect with others, test ideas, garner support. Make your language more muscular and keep an even keel – don’t sound too passionate or emotional don’t shift to higher voice pitch, move past confrontation without taking it personally. Take up “real estate” at the conference table — don’t retreat back in your chair. Spread your notes in front of you and lean forward. Don’t let others interrupt you or “steal” your ideas. Learn to brag about yourself. We will write a future blog on communications and the often significant differences between how men and women communicate and the impact that has on success. In short, learn how to build and showcase your achievements. Don’t apologize for “bothering” someone to ask a question and don’t discount your results and accomplishments by chalking them up to luck or timing. Don’t wait to inherit client relationships, be asked on the pitch team or receive comp credit. Again, there is still some inherent bias built into business development, client relationship succession and origination credit. It astounds me how often I will be asked to help a firm prepare for a pitch meeting with a client or prospect only to find the team comprised of white, middle-aged men. This is especially shocking when I find, as is usually the case, that the company doing the interviewing might have two or even three women at the table. Insert yourself into pitches, preferably before a team is put together. When you are involved in client relationships in which a senior partner is moving toward retirement, initiate discussions early (five years in advance) about the relationship, how you can help by taking on more responsibility and face time with the client, and ultimately taking over responsibility for the client relationship. As to receiving credit for new business origination, be sure you understand how the firm’s comp system really works, and how you need to work the system to be sure you are well recognized for new business, expanding an existing relationship, etc. Go into comp review meetings with an outline and be prepared to ask for acknowledgement of financial contribution, especially when others may take credit for it. Stay focused and learn to say “no.” One of the challenges everyone faces today is the desire to spend more time on outside interests and with family. Few people want to devote 3,000 per year to their law practice the way a few still do and many used to. Women seem to have a more difficult time saying no to requests to take on special projects, serve on committees, or help with a BD proposal. Because women are still considered strong relationship builders and nurturers and stronger administratively and for getting things done, they often are asked to head up associate committees, recruiting committees, diversity committees or even serve as deputy office managing partners, which too often means carrying the heavy burden for getting things done. Be intentional and strategic about every request. Try to position yourself eventually for committees that have influence and power, e.g., finance committee, strategy committee, comp committee and the executive/management committee. With less strategic requests, sometimes the best solution is to give the opportunity to another partner or colleague who could benefit from visibility and exposure. “Lean in” and pull others with you. Even as recently as ten years ago, I frequently heard men and women in firms bemoan the fact that some of the most successful women in their firms were the least helpful and supportive of other women in the firm. They had the attitude “I had to sacrifice for this and pull myself up alone so you should too.” Given all the challenges that women still face in the workplace, they need to support each other and mentor the next generation to help advance their own and others’ success.